Falcon Expenses: fully mobile expense tracker. Track mileage expense, scan receipts and log billable hours. Never go to a desktop. Never forget to keep track of mileage again! Never forget those obscure receipts again! Never spend HOURS recreating that expense report at the end of the month again! Shy not? Because you have already scanned that receipt, and you have already put mileage in, either manually or by actual odometer reading, and you have generated an expense spreadsheet report which is simple sand neet, surely to be accepted by any sales manager! I LOVE THIS APP! Never dread that expense report again! Toss those receipts. Instead, take pictures of receipt while on-the-go and we enter the data for you. Watch a demo video, here. Create custom tags and categories, and add comment to expenses. All receipt images are attached to submitted expense reports. Never forget tax-deductible mileage expenses. Use an integrated timer to track billable hours. Billable hours are calculated based on the hourly rate provided by the user and the number of hours tracked. Hours can be automatically logged with the timer, or if you forget to turn the timer on, manually enter your hours. 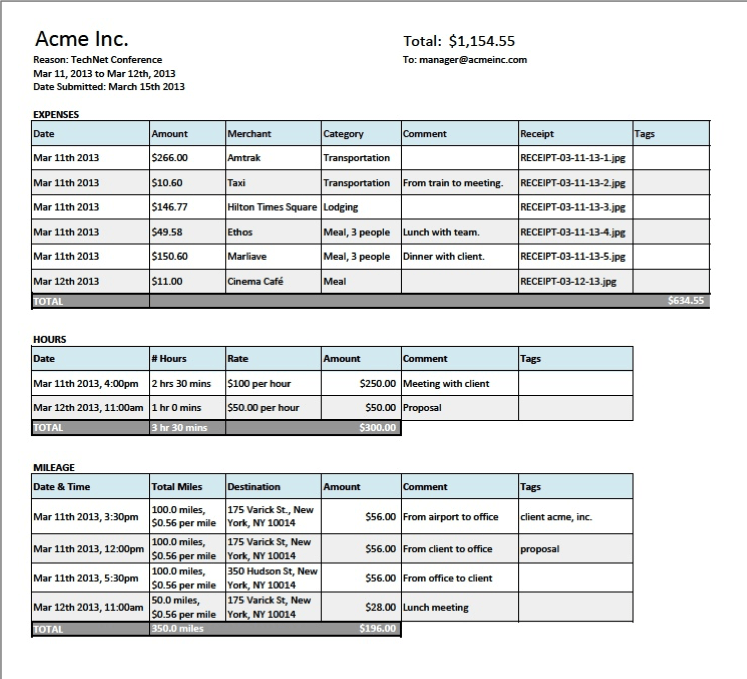 Email export expense reports in PDF and/or spreadsheet format, all from your phone. PDF reports are formatted with an easy-to-read report summary on the top page, followed by four receipt images being attached to each of the pages that follow the report summary. Spreadsheet report exports come with receipt images individually attached in addition to an attached report summary in a CSV file. Accountants and bookkeepers find the spreadsheet format to be convenient for sorting, reviewing and uploading the expense information as needed. No more daunting and disparate steps to complete your expenses. 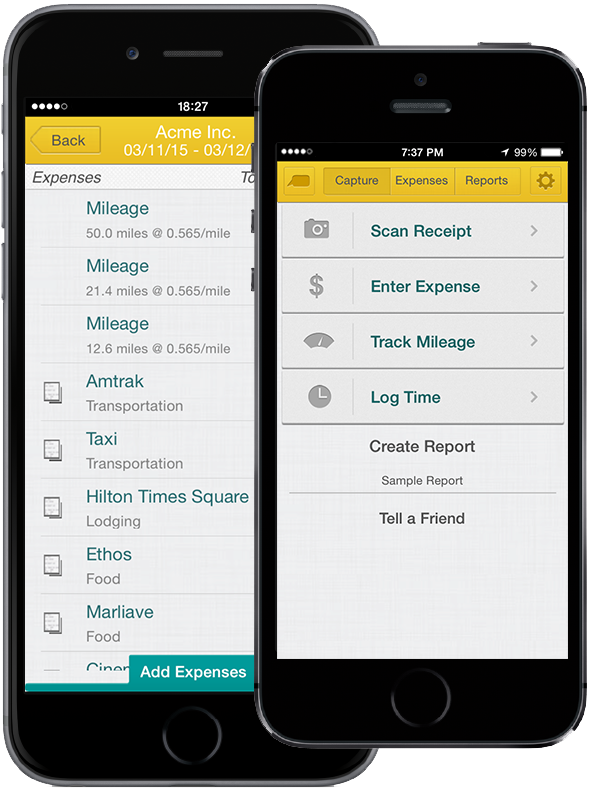 With Falcon Expenses the process is streamlined and organized, all from your phone. Keep your accountant and clients happy by using Falcon Expenses easy to use expense capture and reporting mobile application. Submit reports in PDF and/or spreadsheet formats by email from your phone. Reports are conveniently sent as an email attachment and can be emailed to anyone. Seamlessly capture pictures of receipts for scanning. Automatically track mileage expenses. Log time with an integrated timer. Organize all of your expenses into easy-to-read reports. Do all of this faster than traditional methods, such as manually entering the data into an excel spreadsheet and taping receipts to expense reports, so that you can get reimbursed faster. Falcon Expenses was founded on the idea on the idea of a fully mobile workforce and the utilization of mobile technology to create an efficient mobile solution for expense tracking. Using the Peregrine Falcon, the fastest and most efficient animal in the world as our symbol, our mission is to help professionals and businesses do their expenses in the fastest and most intuitive way possible.